To have a face authentication system tolerant to facial expression variations and registration errors. The face authentication is a challenging research topic since the human face can always generate significant variations in appearance because of facial expressions, rotation, scale, shift, lighting condition, etc. Here we propose a new approach to perform face authentication tolerant to facial expression variations and registration error. The basic idea is to use Optical flow to capture face appearance motion when there are variations in facial expressions, and model the resulting optical flows using the eigenspace model. The eigenflow based face authentication is consisted of the following several modules. The left half of the figure shows two face images from the same subject, but with different expressions. 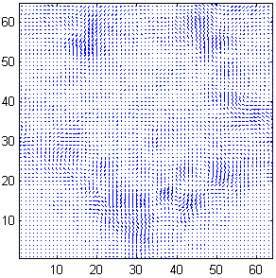 Resulting optical flow is shown below these figures. Also by using the first image and the optical flow, we can construct a predicted image that is close to the second image. We call the pixel difference between the predicted image and the second one as the residue image, which is shown as the third figure in the top row. For the same subject, this residue image would have low energy because the motion of most pixels can be modeled well by the optical flow. The second set shows the same except for the fact that the two input images are from two different subjects. Obviously, the optical flow looks more irregular when the two images are from different subjects. Also the residue of motion prediction has more "error". Both of these two clues can help to discriminate these two cases, which is the task of authentication. Optical flow images between face images are trained using Principal Component Analysis(PCA). This figure show the first three eigenflows trained from expression images of one subject. Some prominent movement of facial features, such as mouth corner, eyebrow, scale, nasolabial furrow, can be seen from them. 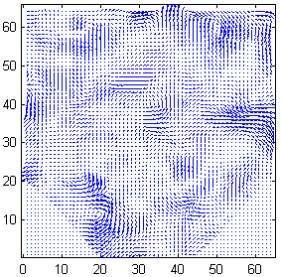 The residue to this eigenflow space can be useful for authentication. Finally the eigenflow residue, combined with the optical flow residue using linear discriminant analysis ( LDA ), determines the authenticity of the test image. We have do experiments using this approach based on our own database and public databases. Experimental results show that the proposed scheme outperforms the traditional methods in the presence of facial expression variations and registration error. Each subject has 75 images showing different expressions. These face images are collected in the same lighting condition using CCD camera. Face images have been well-registrated by the eyes location. The following example shows some expression images of one subject. Download our face expression database now. Xiaoming Liu, Tsuhan Chen and B.V.K. Vijaya Kumar, Face Authentication for Multiple Subjects Using Eigenflow. Pattern Recognition, special issue on Biometric,Volume 36, Issue 2, February 2003, pp. 313-328. Xiaoming Liu, Tsuhan Chen and B.V.K. Vijaya Kumar, On Modeling Variations For Face Authentication, In the Proceeding of the International Conference on Automatic Face and Gesture Recognition 2002, pp. 369-374, 20-21 May 2002. Any suggestions or comments are welcome. Please send them to Xiaoming Liu. Revised: March 07, 2004 .